The 2020 BMW M135i hatch will take on VW’s Golf R.
YOU could argue BMW should have built this car years ago. 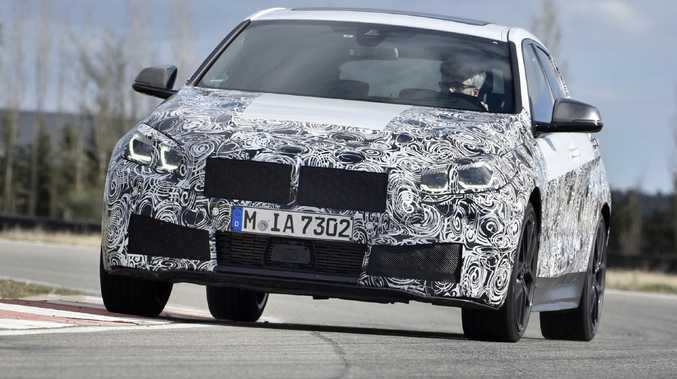 The upcoming BMW M135i pictured in camouflaged wrap is a turbocharged, all-wheel-drive rival to the likes of Volkswagen's Golf R and the Audi S3. A machine for people who grew up on Gran Turismo and the cult of Subaru's WRX, the M135i hatch rides on new underpinnings shared with Mini and the BMW X1. Powered by a 2.0-litre engine with 225kW of power, the 135i drives all four wheels with the aid of a new stability control system intended to minimise front-end push associated with front-wheel-drive cars. BMW reckons it offers "a completely novel driving experience". We'll know more about the model closer to its Australian debut in 2020. Expect it to sit above the Golf R and Subaru WRX STI with a $60,000-plus price tag, though BMW would be wise not to position it out of reach. The new 1 Series represents a change of thinking for BMW. Due locally in 2020, the new M135i will replace the rear-wheel-drive, 3.0-litre six-cylinder M140i which represents a unique take on the hot hatch theme. As the only hatchback that drives the rear wheels, the outgoing 1 Series compromises its packaging and cabin layout in favour of hardware normally associated with sports cars and luxury vehicles. But BMW reckons the majority of customers would prefer a roomy interior to the superior steering feel and tail-wagging antics often found in rear-drive models, so the next-gen 1 Series will have more sensible hardware in line with rivals such as Audi's A3, the Mercedes-Benz A-Class and VW Golf. Which brings us back to the argument that a hot hatch variant would have been useful five years ago, when the brand launched its first front-drive hatch in the 2 Series Active Tourer. 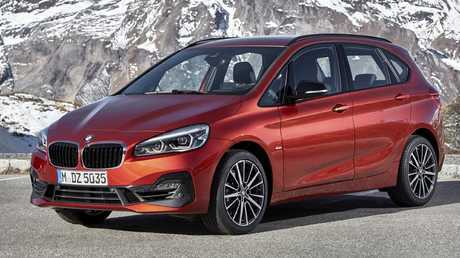 Unloved by critics and customers, the dumpy-looking, dynamically-challenged hatchback arrived just as BMW adopted a confusing naming strategy placing the BMW 2 Series (a focused rear-drive coupe and convertible) alongside the BMW 2 Series Active Tourer (a van-like front-drive proposition) in showrooms. BMW has not announced the future of 2 Series coupe and its M2 spin-off. BMW’s 2 Series Active Tourer was its first front-wheel-drive car. The Active Tourer is on thin ice in Australia, falling down the sales charts as people choose more fashionable SUVs. Facelifted in 2018, it attracted just one customer in February.